This Applet generates unguessable passwords. Make sure you paste the generated passwords somewhere for safekeeping. Doing this also helps verify the value you are pasting blind into web forms. The Australian government recommends changing passwords frequently, at least twice a year, to prevent identity theft and using unguessable passwords at least 8 characters long with a mixture of digits and both upper and lower case letters. The password generator defaults to 10 characters. The Australians celebrate a special day in early June to change their passwords. Don’t use the same password at multiple sites unless you don’t care at all about the security of any of them. A word in the dictionary can be cracked in under a second. That is no security at all. Password is free. You may generate as many passwords as you please. Password is easy to use. You can select your own balance of convenience and security, deciding if you want your password to include digits, lower case letter, upper case letters and/or punctuation. Password avoids generating passwords with the characters 0 O 1 l I | in them because they are so easily confused. Password is more secure than other password generators because your password is never sent over the Internet, or stored, even temporarily, on a server. Of course, once you receive it, security is up to you. Internally, Password uses Oracle’s high security encryption-grade random number generators. You, or an expert, can inspect the source code for Password to be sure there is no possible way it can leak your passwords. You, or an expert can use Wireshark, to confirm that Password sends no information to any server. Most other password generators have to do this, legitimately, since a server does the calculations to generate the password. In a highly secure situation, you can run Password as an application on a secure computer without access to the Internet. It will run on pretty was any computer — anything that supports Java. You must install a recent Java JVM (Java Virtual Machine) on your computer and engage it in your browser. You must specially grant permission for it to run. It uses cryptography grade pseudorandom numbers. A purist might want to use true random numbers, though there is no practical difference for this application. for the current version of Password Generator. Applet to generate unguessable passwords. 649K zip for Password Generator Java source, compiled class files, jar and documentation to run on your own machine either as an application or an Applet. access password source in repository with [Tortoise] Subversion client on wush.net/svn/mindprod/com/mindprod/password/. 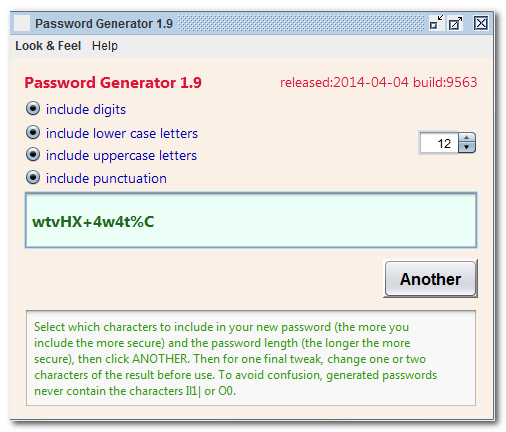 download ASP PAD XML program description for the current version of Password Generator. Password Generator is free. Full source included. You may even include the source code, modified or unmodified in free/commercial open source/proprietary programs that you write and distribute. Non-military use only. Unlike most other generators, passwords generated by my Applet are never sent over the net, where they could in theory be snooped on, particularly by an agency of the American government who have legal and mathematical abilities to crack pretty well anything they please. Passwords are generated in your machine and never leave your machine. Any password generator could in theory retain a copy of the password that it gave you and pass it on to the bad guys. You must trust the author. In the case of my Password generator, you can download the source, examine it for any back doors, or have a programmer friend do so, compile it yourself and run it offline.